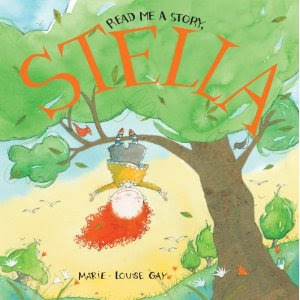 It's been a long four-year wait, but Marie-Louise Gay's Stella and Sam are back in a new book adventure. This is only the sixth Stella book (in addition to the Treasury), but with 3 other Sam books and a tv show, it feels like Stella has always been here despite the four-year wait. Big-hearted Stella and inquisitive Sam are the same as always, just the way we love them. This book is almost all dialogue, so it's a fun read-aloud and I get to remember my Stella and Sam voices. This time Stella introduces Sam to a lot of knowledge she gains from books she takes on a picnic. It feels like a meta book for children's lit lovers. Can you spot the references to The Brothers Grimm, Arnold Lobel or Eric Carle? Just as much fun for a parent reading aloud as for kids who probably have read these books more recently. It just goes to show how important books are in kids' lives even before they begin to read it themselves. Gay's whimsical watercolours are littered with textrues, from the batik sun umbrella to Sam's Chinese-character strewn hat, and easily pull you into a lazy rural summer afternoon. This is a fantastic addition to the Stella and Sam series, I only hope it doesn't take 4 more years for the next one. This is the second book I have reviewed for the Seventh Canadian Book Challenge. I love these Stella books. So sweet! The illustrations get me every time too. I know Marie-Louise Gay's illustrations from the book apps and the Stella and Sam drawing app - all lovely!